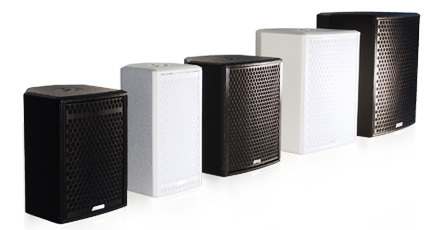 PC5, Full-Range PA Speaker Cabinet from Adamson in the Point Concentric series. 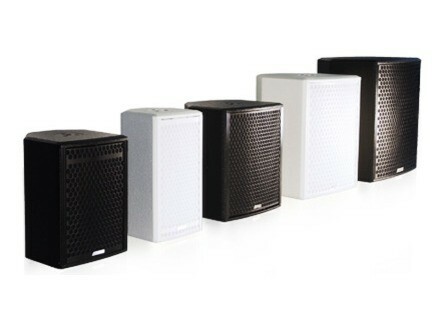 Adamson launched at ISE in Amsterdam the new Point Concentric passive loudspeaker series, which includes 5 compact models. The Point Concentric Series brings a range of passive, co-axial, loudspeakers designed for both installation and rental markets. The multipurpose cabinets are available in a double 5" (PC5), single 6" (PC6), single 8" (PC8), single 10" (PC10) and a single 12" (PC12) version. They all come coated with water borne acrylic paint, while all metalwork is finished with a Sandtex Powder Coating. Keeping form with the acclaimed Point Series, all cabinets can be color matched to the RAL library. The PC5 and PC6 are the smallest cabinets in the Point Concentric Series, and provide a 70-degree conical pattern in a compact package. Both cabinets ship with standard M10 fly points in 4 locations and additional rear Omnimount points. Threaded Pole mount hardware (for mic stand) or barrier strips can be installed, at no charge, on either cabinet by request. Technical specifications are to be announced soon on www.adamsonsystems.com. [NAMM] Turbosound completes the Milan Series Turbosound has re-engineered the portable Milan Series for 2013 and added a full range loudspeaker and a subwoofer.